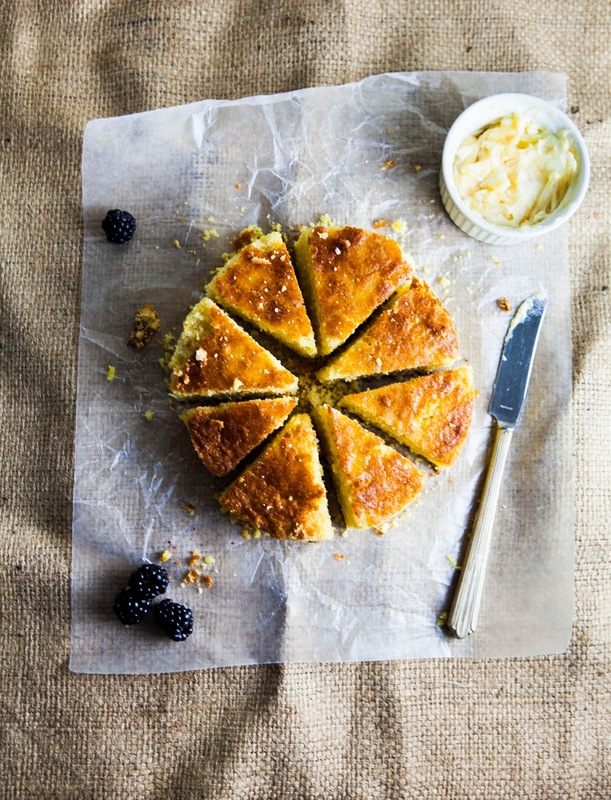 Cornbread & Feast Portland Picks! Summer’s nearly coming to an end, but over here at my house, it’s almost like it’s just getting started. Erlend and I recently moved away from our lovely-but-incredibly-tiny attic apartment and upgraded to a new, spacious house. To help pay my mortgage, Erlend and I have moved in with Kevin, a good friend of ours from college. Boys being boys, the first piece of furniture that Erlend and Kevin decided to purchase for the house was, of course, a barbecue grill. Since then, it’s just been non-stop grillin’ each night. I’ve never been a master of the grill myself. Is it shameful to admit that I’ve always been a little bit grossed out whenever I touch meat? As a result, while the boys hover and fuss over the grill, arguing over the best way to start a fire and arrange the meat, I have absolutely no interest. I just keep to myself in the kitchen, trying to find a way to contribute to the family meal. Truth be told, I’ve only recently acquired a taste for cornbread. When I was growing up, my only exposure to cornbread was through those terrible, microwavable corn dogs that are often available at sports games and movie theatres. The very thought of it made me cringe — I hated its artificial flavor. It was only when living in San Francisco that I acquired a taste for cornbread, at the famed Mission Chinese restaurant of all places. Back in 2010, Mission Chinese didn’t have the critical acclaim that it has today — heck, it didn’t even have its own restaurant space! Instead, it only appeared every Wednesday night at a janky, run down Chinese restaurant on Mission Street. Despite the location, I loved its pop-up dinners and how the restaurant featured guest chefs that presented different types of cuisine. One of my most memorable meals from this dinner series was a dessert dish consisting of cornbread and strawberries, topped off with sorrel and creme fraiche. When first offered to me, I politely declined, explaining that I didn’t like cornbread. The chef gave me a wink and told me to take a bite. And that was when I discovered that real cornbread was a far, far departure from the awful, plastic stuff I had been eating at movie theatres and sports games. 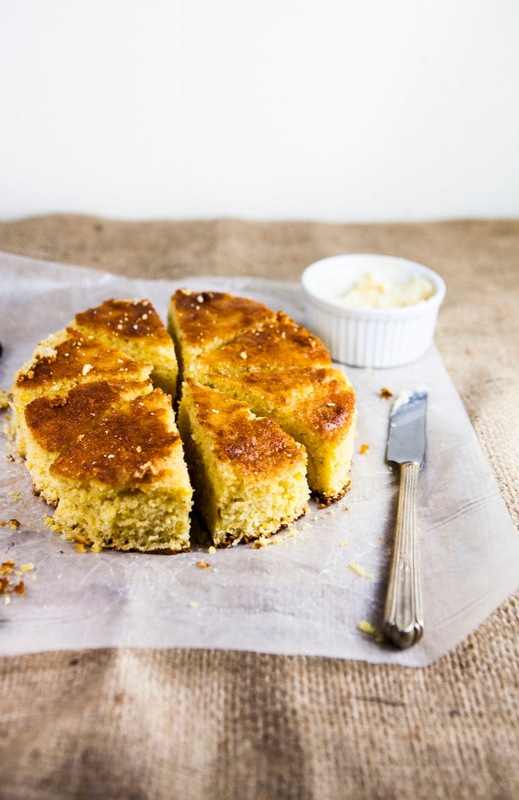 Real cornbread has a wonderful, grainy texture from the cornmeal, which toasts beautifully in the oven. It can be played both savory and sweet — a perfect accompaniment to grilled, barbecued meat, for instance, or with fruit and cream as demonstrated in Mission Chinese’s innovative dessert. Speaking of Mission Chinese, I have some exciting news — I’ve been granted a press pass to Feast Portland, a festival dedicated to all things food and drink in the Pacific Northwest! I’m super excited, as one of the chefs that will be featured during the event is none other than Danny Bowien — that is, the head chef of this Mission Chinese place I keep gushing about. Other celebrity chefs attending include Pok Pok’s Andy Ricker and Momofuku Milk Bar’s Christina Tosi. All three chefs will be cooking at the USA Pears Night Market, which I am incredibly, incredibly, INCREDIBLY excited to attend. No — really. I’ve already planned my eating schedule around this event... three weeks ahead of time. Almost all the events I listed above are either talks or tasting panels that require individual tickets for each event. If you’re looking for a one-stop event where you can just taste absolutely everything and anything, I highly recommend getting a ticket to the Oregon Bounty Grand Tasting. From my understanding, the Grand Tasting features a host of different local products, beer and wine samples, and cooking demos by the event’s visiting chefs. I’ll also be attending the Oregon Bounty Grand Tasting on Saturday (but it's also happening on Friday), so I’ll see you there! But for now, I’ll leave you with this recipe for cornbread from Mission Chinese’s cookbook, Mission Street Food, to keep your appetites wet in anticipation for Feast. 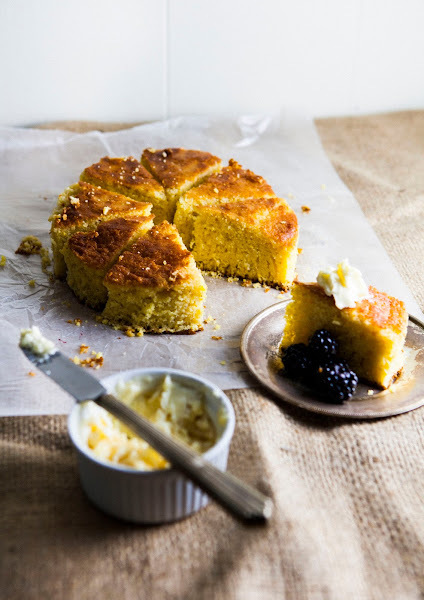 Like all quickbreads (that is, breads that use baking powder/soda as their leavener as opposed to yeast), this cornbread is best when consumed the day it is made, preferably straight from the oven. 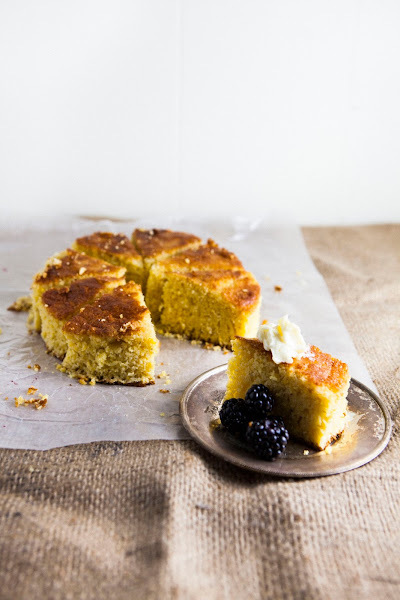 I wasn't kidding when I said that this recipe was pretty versatile — you can use the cornbread for both savory and sweet dishes. I recommend using the cornbread when it's fresh for a sweet dish, pairing the cornbread with whipped cream and strawberries, honey-butter and blackberries (which is what I did), or sorrel, strawberries, and creme fraiche (which is what Mission Chinese did). But when the cornbread turns a day old, I recommend using it for a savory dish. I used it to mop up my saucy barbecue, but a friend of mine also used the cornbread to make grilled cheese sandwiches, an egg in a basket, and croutons for soups and salads. As you can tell, this cornbread lasted us a long time, in many forms and meals. There's an odd measurement in this recipe; specifically, it calls for 1 3/4 tablespoons baking powder. I... don't think a 1/4 tablespoon measurement exists (I already have enough trouble finding 1/2 tablespoon measurements! ), unless I'm completely missing something. What I ended up doing was measuring out 2 tablespoons of baking powder into a small ramekin, and then subtracting 1/4 tablespoon. Janky town, I know, so please let me know where I can find a 1/4 tablespoon measuring spoon if you happen to be the lucky owner of one. Preheat the oven to 425 (F) and prepare your pan by liberally spraying with cooking spray and lining with a piece of parchment paper; spray the parchment paper with cooking spray as well. In a large bowl, combine 3 1/2 cups cornmeal, 1 3/4 cups flour, 1 3/4 tablespoons baking powder, and 2 1/2 teaspoons salt. Whisk until combined. Use a pint glass (or a bottle) to create a well in the center of the dry ingredients, and set aside. In a large bowl, combine 1 3/8 cups granulated sugar, 2 1/4 cups whole milk, 5 eggs, and 1 1/4 cups melted butter. Whisk until thoroughly combined and the mixture is smooth — this'll take a surprisingly long amount of time because there is a LOT of the ingredients involved. Your arm will get tired, but persevere! Once the mixture is smooth, pour the mixture into the well made by the dry ingredients (from the 2nd step). Use a rubber spatula to mix together, making sure to only mix until the ingredients are just combined. Again, this will take a long time because the batter is pretty thick and hearty, but you can do it! Once the ingredients are well combined and the batter is an even, thick yellow, transfer to your baking pan and bake in the preheated oven for 35 minutes, or until a skewer inserted into the center of the bread comes out clean. If the top of the cornbread browns too quickly, cover with aluminum foil. Let rest on a wire rack for 10 to 15 minutes, before serving immediately. Loved reading Mission Street Food! 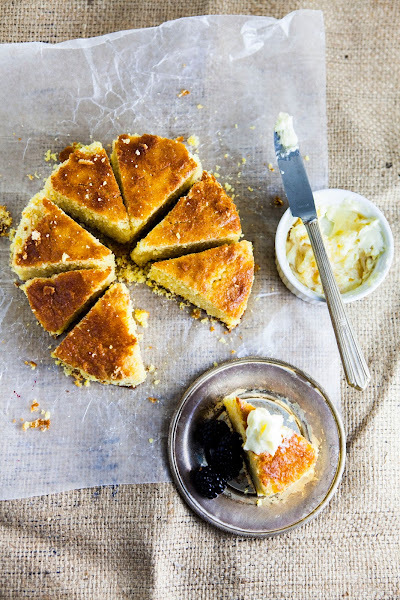 That is some super gorgeous cornbread! Beautiful photos as always! Congrats on moving to a new house, hope to see pics sometime! I have such a hard time photographing mine but I'm sure you'll capture some great moments in yours! It's funny how grilling is such a guy thing. I think it has to do with the cooking outdoors part. I was always so grossed out by meat and was vegetarian and vegan for 13 years, but now I've cut up all kinds of things raw and felt pretty badass!! I still prefer cooking indoors, though! Man I love a good cornbread. I made some this week for a nice southern (and cheap!) meal of beans and cornbread. My son ate it all up exclaiming "cake!" the whole time. :) I'm really excited about the Whole Foods Market Speaker Series at Feast... I'm going to have a really hard to choosing which things to go to and how to pack it all in such a short time! This recipe looks great! We'll be pairing it with our chili this evening, thanks! Also, to help with your tablespoon problem, 1 tablespoon is equal to 3 teaspoons. If you multiply 3 (teaspoons) times .75 (because you want 3/4 of your three teaspoons) it gives you 2.25. Meaning your recipe is asking for 1 tablespoon and 2 1/4 teaspoons of baking powder. I hope this helps you in the future! Thanks for putting solid data in this post. So I am happy to see this site and more update want to know all. aluminum props for sale Aluminum boat props for sale. Buy your Aluminum Prop today and save tons. Largest inventory of aluminum boat propellers available.